Financial market traders bet on whether stock price will go up or down – Stacy Coffman goes online to bet on how bad the flu season will be in Iowa. She admits that she is a risk taker, but her attitude has made her one of the most successful traders in the online flu prediction market. “It’s not my money,” explained Coffman, referring to the $100 or “flu bucks” that “flu traders” start with at the beginning of each season. She was able to double her money during her first flu season as an active trader, but just broke even during the second. She figures she’ll come out ahead in the 2006-2007 flu season. Not just anyone can invest in the flu market. Coffman is a microbiologist at the University of Iowa Hospital and Clinics and one of the healthcare professionals who trade in the Iowa flu prediction market. While stock market traders try to predict which company’s stock will do well, flu traders try to predict what the flu activity level will be in a given week. The founders of the Iowa market hope fluctuations in prices can help forecast the future, since the prices represent the collective “wisdom of the crowds.” This particular crowd includes the school nurse who tells you that your child is sick, the lab technician who tests your bodily fluids, and the pharmacist who fills out your prescriptions. During the flu season, some weeks are worse than others. The shares that flu traders buy and sell represent a particular range of flu activity, from as low as “no activity” to “widespread.” When multiple traders buy the contract for a particular flu activity level, the demand drives the price of that contract up. The highest priced contracts represent what most investors think the flu activity level might be. The Iowa flu prediction market is in its third year after opening in January 2004, and the group is already seeing results. “Statisticians at CDC say that influenza is inherently unpredictable, that it’s such a random event that there’s no way that you can predict future outcomes,” said Forrest Nelson, professor of economics at the University of Iowa and one of the founders of the Iowa prediction markets. But the prediction market thrives on uncertainty. Nelson and his colleagues have found them more accurate in predicting flu activity than projections based on historical patterns. “Economists have always known that prices carry information,” said Nelson. He and other economists point to how other financial market prices can indirectly predict future events. Future markets, for instance, involve buying and selling contracts that represent commodities like orange juice. If traders think there will be a change in the near future – perhaps cold weather will kill half the orange crop – they may buy up orange juice contracts now so that they can sell at a higher price when oranges are in short supply. “So if you want to know whether there’s going to be a freeze in Florida, it’s better to watch the futures market on orange juice futures than watch the weather channel,” quipped Nelson. He points to an old economics paper which shows that futures markets were quicker to predict weather than the National Weather Service. Traders understand the weather better than the National Weather Service, but each trader has access to all sorts of private information: a meteorologist friend, the Farmer’s Almanac, an old injury that hurts when cold weather rolls in. They then make trading decisions based on the best information they have. Their combined individual information translates into the overall supply and demand for oranges reflected in orange prices. While financial traders are more focused on individual gains than collective predictions, Nelson and his colleagues at the University of Iowa set up the first official markets specifically to predict future events. “We can point to the exact day and the time of day when the idea first sprang on us,” said Nelson. The Reverend Jesse Jackson had surprised everyone by defeating Michael Dukakis in the Michigan Democratic presidential primary of 1988. The polls had suggested that Jackson would only pick up five to ten percent of the vote. Nelson and two of his economist colleagues from the University of Iowa were discussing the confusion over sandwiches at a local sports bar. Eventually, someone threw an idea on the table: why not set up a market to predict the election? The group blew off several meetings and scratched out a plan on a growing pile of paper napkins. Since then, the Iowa group has turned those ideas into prediction markets for issues ranging from presidential elections to box office totals for movie openings. The highest profile project involved the Defense Advanced Research Projects Agency (DARPA), a research arm of the U.S. Department of Defense. DARPA contracted Nelson and his colleagues to run prediction markets on internal U.S. government agency issues, while a Caltech group focused on the Middle East issues such as the Israeli economy and terrorism events. DARPA was also interested in predicting events that could impact U.S. military forces stationed worldwide, such as SARS, the flu-like respiratory disease from Asia that caused a global scare in 2003. The project fell apart in 2003 after U.S. senators denounced the market focusing on the Middle East as a “fantasy league terror game” in the media. But the collaboration provided the seeds for the flu prediction market, and Nelson and fellow economist George Neumann decided to pursue the SARS idea independently after their DARPA contract fell through. First they needed someone who knew about infectious diseases. But the idea of prediction markets sounded strange to healthcare professionals, who often didn’t know anything about trading or markets. “We tried to contact federal agencies and all kinds of folks, and basically they just viewed what we were doing as total crackpot stuff,” recounted Nelson. That’s when the group approached Phil Polgreen at a University of Iowa party. A young infectious diseases fellow who had just finished his clinical training, Polgreen also had a background in economics. Polgreen loved the idea of prediction markets. but pointed out that SARS would subside by the time a market was up and running. Flu, on the other hand, was perfect. The disease occurs every year on a regular basis but there’s still uncertainty about which influenza virus strains will pop up each year. Polgreen became the point-man on the medical side of the project, the “snowplow” who pushed the project forward as Nelson called him. As the youngest member of the team by a few decades, he did the bulk of the work to get the flu market running. He found funding for the project through the Robert Wood Johnson Foundation, one of the largest philanthropic organizations focused on healthcare issues. Then he cobbled together the first network of flu traders. Stacy Coffman – one of the active flu traders – gets her picture of flu activity in Iowa through her job as a microbiologist monitoring local outbreaks. “I’m an infection control professional, so I’m aware of influenza diagnoses in our hospital,” said Coffman. She and other traders aren’t in it for the money; any profits from trading translate into educational grants at the end of the trading season. As healthcare professionals, they like the idea of just looking at market prices and instantly knowing what their peers are thinking. Pentella has even looked at market prices to make job-related decisions. “Last year there was less flu overall in Iowa, and we were looking at resources because we were dealing with a mumps outbreak during the flu season,” said Pentella. Knowing the market prices predicted lower flu activity in the future, he decided to pull lab resources from flu and devote them to mumps. 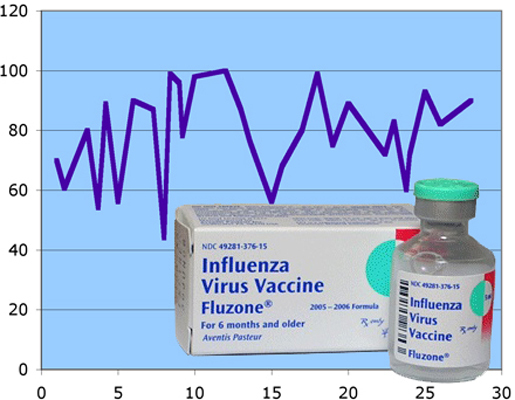 Based on the 2004-2005 flu season, predictions of flu activity at the end of a week that were made during the week were correct 71 percent of the time, and were within one flu activity level or color 93 percent of the time. Accuracy fell as predictions were made further ahead of time – yet predictions made as far as seven weeks ahead were still within one level 80 percent of the time. “The markets do a pretty good job; they don’t beat historical averages by a long ways, but they do provide some improvement,” observed Nelson. As the prediction markets run, he and fellow economist George Neumann are assessing whether that improvement is worth the effort. The predictions markets are expanding, with Polgreen recruiting preexisting flu surveillance groups to join as traders in a new market for flu activity level in North Carolina. The group has also opened a market for predicting the effectiveness of this year’s flu vaccine. Since flu strains often mutate and change from year to year, the vaccine is made months in advance to handle whichever strains experts think will be most common during next winter. How well the vaccine works depends on whether the experts were right; traders can choose contracts indicating whether they think the vaccine will be better, the same, or worse than last year’s. Despite a focus on flu within the United States, the newest market takes predictions to the global level by targeting avian flu – the feared trigger for the next flu pandemic. The most notorious avian flu strain, H5N1, kills approximately 60 percent of its victims infected by birds, and scientists are watching in case the strain acquires the ability to jump from human to human. Nelson and Polgreen hope to get traders from all over the world for the avian flu prediction market, but are starting their recruitment efforts with preexisting traders such as Stacy Coffman. She already plans on expanding her sources of flu information. A Pandemic’s Dirty Tricks: Researchers use modern techniques to solve the mystery behind the deadliest flu virus.